A carriage bolt or coach bolt has a rounded, dome or countersunk head with a square neck whick keeps the bolt from turning once it's been tightened into place. Commonly used in building, timber and flooring. A carriage bolt should be inserted into a pre-drilled hole and tightened with a nut. 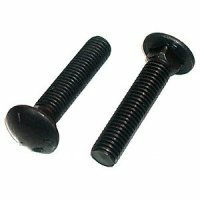 Carriage bolt pictures are a general representation and not an actual picture of the product you will receive. Threads will vary according to the individual bolt sizes and dimensions. ISO standards for threads are: length is twice the diameter of the bolt plus ½ inch. If you are looking for fully threaded bolts please call direct at 800-872-5557.